"This makes seven 1-cup servings." Heat a large skillet over medium-high heat. Cook and stir beef in the hot skillet until browned and crumbly, 5 to 7 minutes; drain and discard grease. Bring a pot of lightly salted water to a boil. Cook shell pasta in the boiling water, stirring occasionally until cooked through but firm to the bite, 8 minutes. Drain. 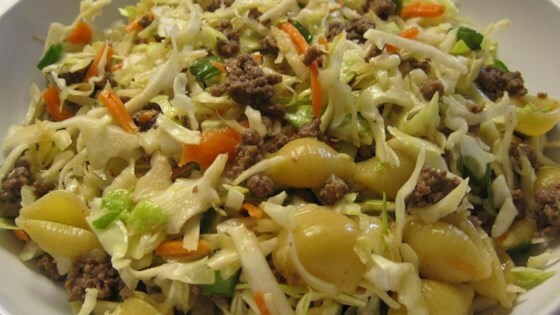 Mix ground beef, Napa cabbage, carrots, and green onions in a large salad bowl; stir in cooked shell pasta. Whisk soy sauce, red wine vinegar, honey, lemon juice, olive oil, and red pepper flakes together in a small bowl; drizzle over salad and stir thoroughly to coat. Never stop eating this tasty Crack Slaw!